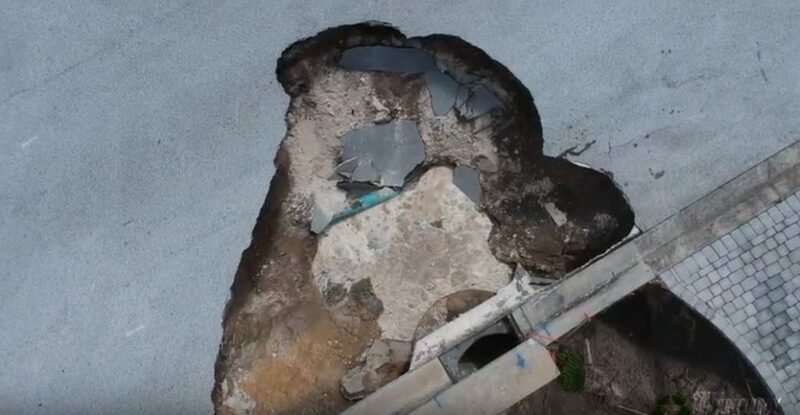 Four sinkholes have opened up in a fast-growing retirement community, The Villages, in Florida, including one in front of a home that was abandoned months ago because of an earlier sinkhole. The new sinkholes opened up Monday in The Villages following a week of nonstop rain in central Florida. 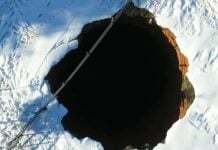 The biggest sinkhole is about 30 feet deep and 25 feet long. No evacuations were ordered as of Monday afternoon. 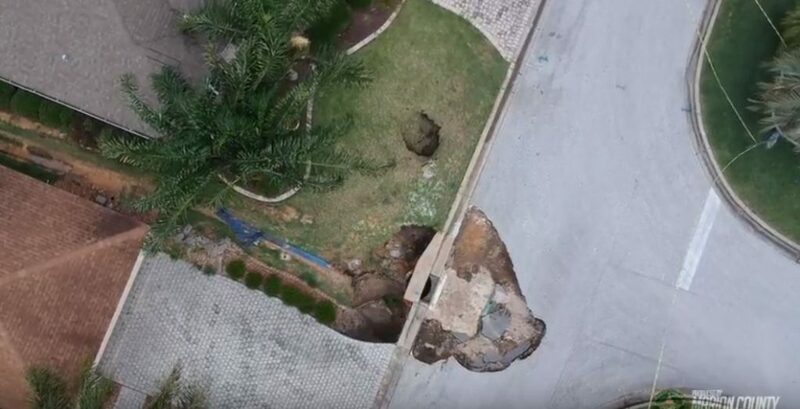 The largest of the four new sinkholes opened up in front of a house and swallowed half of the road. 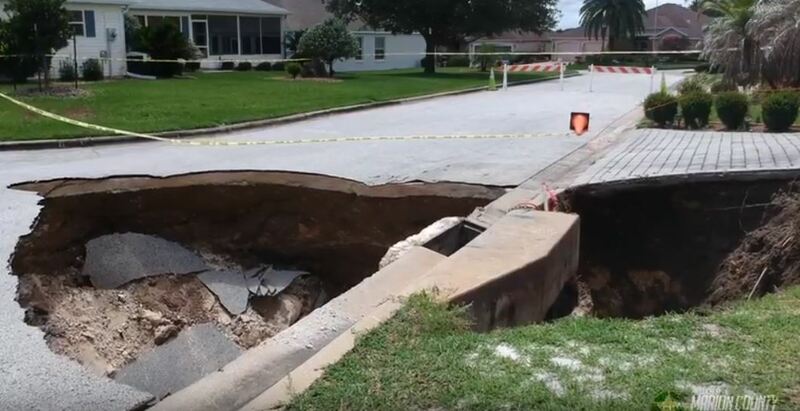 The sinkholes appeared after record-breaking rains since a week in Florida. The 4 new sinkholes are in a golf course community lined with homes and a lake. 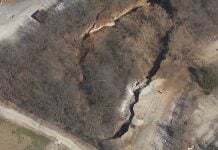 Three of the sinkholes are visible. One of them is in the road, while the other two are on individual properties. The fourth sinkhole reopened underneath the lake on the golf course behind the homes. 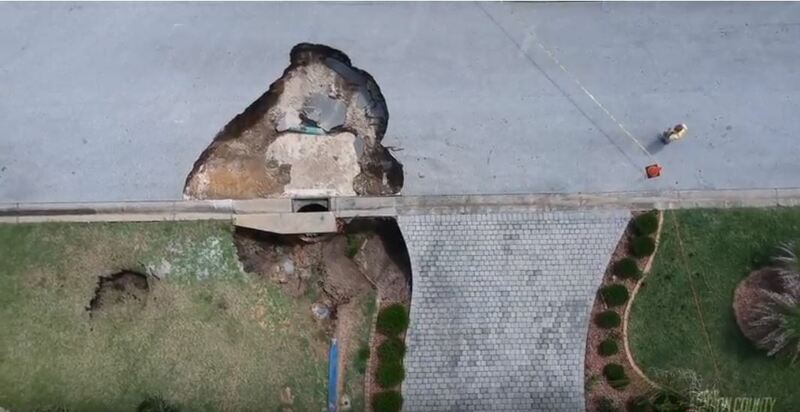 Two homes and three people were evacuated from the neighborhood in February because of a sinkhole. 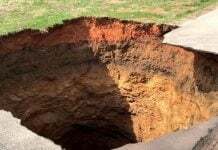 The Villages, which has historically reported high numbers of sinkholes because of the soft soil where thousands of homes have sprouted, has always been a problem in the Sunshine State — unbeknownst to many retirees who settle there. And of course people selling real estates over there will not say a word… There’s only $$$ in their heads! Do you remember when a pond was literally dried up by sinkholes last month in Florida? Golf course is the surface facility of the reptilian secret underground base. This place is very close (next) to Ocala National Forest. If you see this place on Google Map, you can also see a bombing range in the middle of Ocala National Forest. The home owner explaining the sinkhole on his property on the youtube video in this page looks like a reptilian. Just focus on many dots on his face. You can see those dots and his face look like shape-shifting. As I mentioned before, my son was trapped in the bathroom of a Chinese buffet in Silver Springs at the entrance of Ocala National Forest. After my son entered a bathroom, suddenly door was locked. He could not get out, but he managed to crawled under the door, and he escaped from the trap. You think you can eat good food in Chinese Buffet, but you might become their (reptilians’) good food. This is not a joke! More holes in the ground produced by shock waves from HAARP radiation. Más agujeros en el suelo producidos por ondas de choque desde radiación HAARP. US 395 is the major highway toward Bridgeport & Mammoth Lake. Around this mountainous area, there are some strategic US Marine facilities including Marine Corps Mountain Warfare Training Center & Sweetwater (US Marine Corps) Airport. That is why this area is the target of Galactic Federation of Light. Some time ago, I found some comment about Marine Corps Mountain Warfare Training Center. The comment said that some buildings on that base had been destroyed by avalanche. The comment was written by the retired Marine guy. I cannot find this information anymore. M2.6 Earthquake in LaFayette, Georgia. The depth is 10.1km a shallow earthquake as being attacked and cleansed by Galactic Federation of Light. The coordinates are 34.721°N 85.349°W. If you look at Google map, you can find out that the location is just beside a small quarry (=the entrance of the reptilian secret underground base). If you zoom in this location, you can see the green letter says “Bluebird Gap”. This is not a park even the letter’s color is green. This is the reptilian underground base’s name called “Bluebird Gap”.